Abcam’s STAT3 (pY705) and STAT3 (Total) in vitro SimpleStep ELISA™ (Enzyme-Linked Immunosorbent Assay) kit is designed for the semi-quantitative measurement of STAT3 (pY705) and Total STAT3 protein in Human cells. Signal transducer and transcription activator that mediates cellular responses to interleukins, KITLG/SCF, LEP and other growth factors. Once activated, recruits coactivators, such as NCOA1 or MED1, to the promoter region of the target gene (PubMed:17344214). May mediate cellular responses to activated FGFR1, FGFR2, FGFR3 and FGFR4. Binds to the interleukin-6 (IL-6)-responsive elements identified in the promoters of various acute-phase protein genes. Activated by IL31 through IL31RA. Involved in cell cycle regulation by inducing the expression of key genes for the progression from G1 to S phase, such as CCND1 (PubMed:17344214). Mediates the effects of LEP on melanocortin production, body energy homeostasis and lactation (By similarity). May play an apoptotic role by transctivating BIRC5 expression under LEP activation (PubMed:18242580). 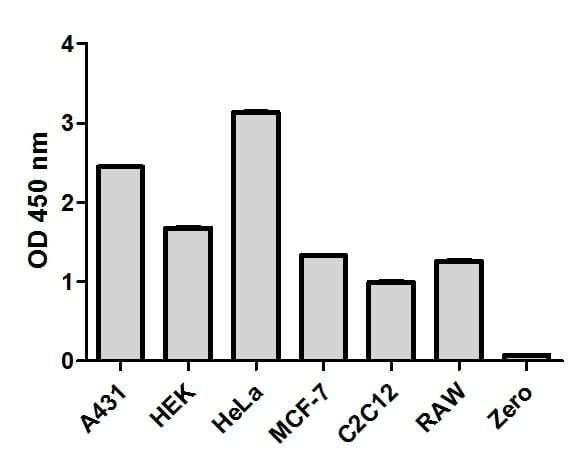 Cytoplasmic STAT3 represses macroautophagy by inhibiting EIF2AK2/PKR activity. Heart, brain, placenta, lung, liver, skeletal muscle, kidney and pancreas. Tyrosine phosphorylated upon stimulation with EGF. Tyrosine phosphorylated in response to constitutively activated FGFR1, FGFR2, FGFR3 and FGFR4 (By similarity). Activated through tyrosine phosphorylation by BMX. Tyrosine phosphorylated in response to IL6, IL11, LIF, CNTF, KITLG/SCF, CSF1, EGF, PDGF, IFN-alpha, LEP and OSM. Activated KIT promotes phosphorylation on tyrosine residues and subsequent translocation to the nucleus. Phosphorylated on serine upon DNA damage, probably by ATM or ATR. Serine phosphorylation is important for the formation of stable DNA-binding STAT3 homodimers and maximal transcriptional activity. ARL2BP may participate in keeping the phosphorylated state of STAT3 within the nucleus. Upon LPS challenge, phosphorylated within the nucleus by IRAK1. Upon erythropoietin treatment, phosphorylated on Ser-727 by RPS6KA5. Phosphorylation at Tyr-705 by PTK6 or FER leads to an increase of its transcriptional activity. Dephosphorylation on tyrosine residues by PTPN2 negatively regulates IL6/interleukin-6 signaling. Cytoplasm. Nucleus. Shuttles between the nucleus and the cytoplasm. Translocated into the nucleus upon tyrosine phosphorylation and dimerization, in response to signaling by activated FGFR1, FGFR2, FGFR3 or FGFR4. Constitutive nuclear presence is independent of tyrosine phosphorylation. Predominantly present in the cytoplasm without stimuli. Upon leukemia inhibitory factor (LIF) stimulation, accumulates in the nucleus. 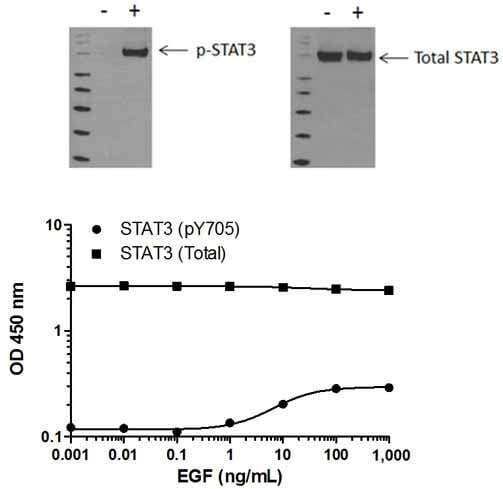 The complex composed of BART and ARL2 plays an important role in the nuclear translocation and retention of STAT3. Identified in a complex with LYN and PAG1. Our Abpromise guarantee covers the use of ab176666 in the following tested applications. Example of a typical STAT3 (pY705) and STAT3 (Total) cell lysate dilution series. Background-subtracted data values (mean +/- SD) are graphed. Linearity of dilution in representative sample matrices. 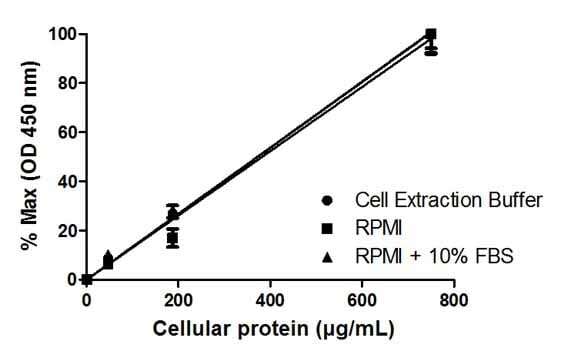 Cellular lysates were prepared at 3 concentrations in common media containing 1X Cell Extraction Buffer PTR. Data from duplicate measurements of STAT3 (pY705) are normalized and plotted. 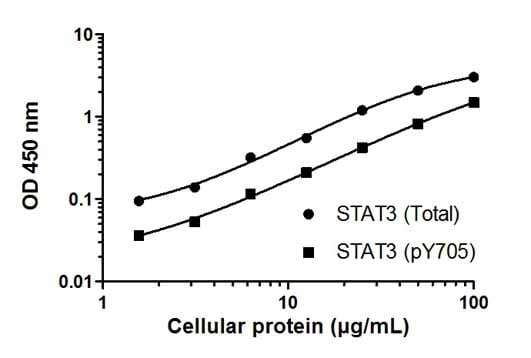 Cell line analysis for Total STAT3 from 200 µg/mL preparations of cell extracts. Data from triplicate measurements (mean +/- SD) are plotted and compared to 1X Cell Extraction Buffer PTR (zero). Induction of STAT3 (pY705) phosphorylation in A431 cells in response to EGF treatment. A431 cells were cultured in 96-well tissue culture plates and treated (15 min) with a dose-range of EGF before cell lysis. Data from quadruplicate measurements of STAT3 (pY705) are plotted and compared against total STAT3 protein levels. Comparative STAT3 (pY705) and STAT3 (Total) data also shown by Western Blot. ab176666 has not yet been referenced specifically in any publications. Publishing research using ab176666? Please let us know so that we can cite the reference in this datasheet. There are currently no Customer reviews or Questions for ab176666.